Mandatory phone reservation is required in advance. 45 minutes for one group. ¥864 per person (tax included). Private use is offered from 2 to 5 people (for any use by one person requires the fee of two people). 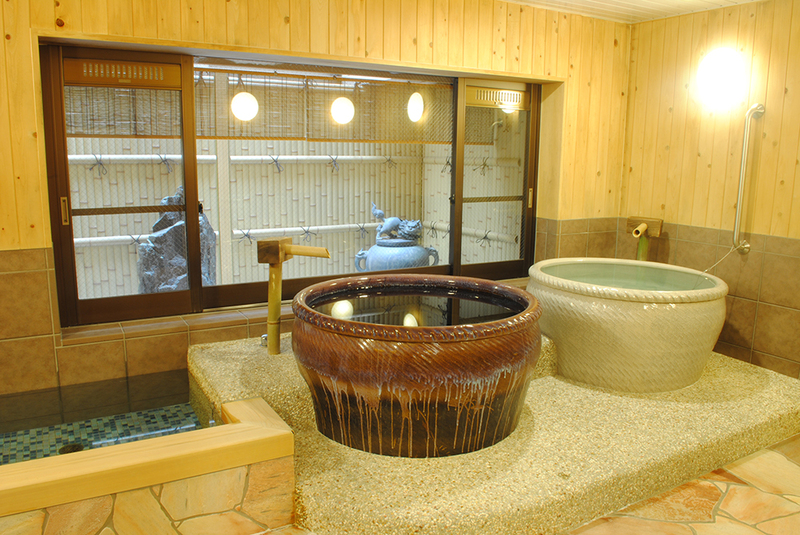 There is one bath tub of Kohmeiseki hot spring and two bath tubs made of Shigara-yaki pottery. We are proud to provide hot springs that help to heal the body, and relieve stress and fatigue, which you can experience by alternating hot spring tubs. The fee for children is 50% off, and infants are free of charge. The “Fitness stepping stones” help to stimulate the soles of the feet (our “second heart”) and can be found inside the bathroom. Your feet will feel relieved and refreshed.. Please try once. Please select a time from below and call us for a reservation:16:00, 17:30, 19:00, 20:30, 22:00.